We have an old fashioned philosophy here. "Take care of the customer, take care of the fish, take care of our staff, and they will take care of us". While this is a simple and old fashioned concept, we use every bit of technology, software, and products to offer the best and most convenient services and products to our customers. This is also what allows Red's to out compete bigger box-chain style retailers. Our combined staff of fly shop employees and subcontractor guides is approximately a team of 30 proffessionals. Learn more about our Red's Fly Shop guides and shop staff. The history of Red's dates back to 1932 when it was known as "The Lattice Inn". Although reports are somewhat unsubstantiated, it is whispered that the Lattice Inn was not for the feint of heart, bearing some resemblance to "Lolo" in Norman McLean's A River Runs Through It. The Lattice Inn burned to the ground at some point in the 30's and was never rebuilt. Over the next 60 years, the property would see a variety of faces and uses including Glen's Drive In restaurant, several phases of trailer parks, and most recently, Riverview Campground and RV Park. Sharon Larsen (a.k.a. Marlene) owned and operated the property since the early 1960's. She often enlisted the help of Loman Blankenship (a.k.a. Red), who was handy with maintenance, repairs, and always had time to shoot the breeze with wayfaring travelers. During this time Red and Marlene got married and made some nice additions to the services they provided including vehicle shuttles and pontoon boat rentals. Although the store had always stocked a few fishing supplies, they added a small fly assortment and some accessories to the front porch of the trailer. This coincided with the Yakima River becoming Washington State's only catch-and-release Blue Ribbon trout fishery in the early 1990's. Many of the longtime Yakima River anglers and campers came to know and appreciate these two unique individuals. When Red and Marlene decided to retire in 2001, it was important to them that those who took over would continue what they'd started. After a series of chance meetings that many would call fate, or even divine intervention, a mutual agreement was made between them and the current founding partnership. Red and Marlene were able to happily retire in the Ellensburg area. They continued to come by and see how things were going until Red passed away a few years ago at the age of 80. The new partnership was made up of Anthony Robins, Steve Joyce, and Richard Leider. Anthony Robins was an orthopedic surgeon in Bellevue. Richard ran a property development and management company in Seattle, and Steve had been a full time fly fishing guide in MT and South America. Steve is Tony's nephew, and both were born and raised in Montana. Rick Leider is a family friend and fishing partner. From the start, we had a vision for the property that was hard for many to see at that point in time. This property is truly an oasis in the desert. It is ideally located in the center of the most popular section of the Yakima canyon. Fittingly, this development was deemed "Project Discovery" by the founders after the new Sage fly rod series that became popular during that time. Project Discovery was a 3 tiered project that included a fly shop and guide service, lodge, and restaurant. Permitting began immediately, and took a full 7 years to complete. The shop floor is a fun place to shop and visit, but our biggest business is online shopping and phone orders to customers all over the world. Most of our inventory is in the basement, so if you can't find it on the shop floor please ask! July 2013 marked the opening of the restaurant, and completion of the original vision Tony, Steve, and Richard had created. Steve has been the Managing member of the property from the beginning, and Tony and Richard still get over the mountain to help with events or recreate themselves every chance they can. The name "Red's" will continue, in tribute to Red and Marlene, and also in honor and remembrance of Tony's father and Steve's grandfather, Red Robins. 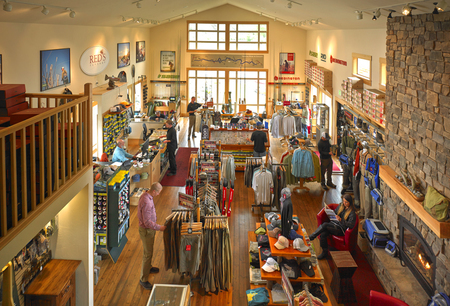 Today, the Red's Fly Shop ownership team has a few more members, but the values and vision set in motion many years ago has not, and will not, change. We are proud of what Red's Fly Shop has become, and the true measure of achieving our goals is proven by the amazing clients we have met. At Red's, our business philosophies are simple. We believe in taking care of the fish and the river. We will always take an active role and set an example for others in protecting these resources. We also believe in taking absolute care of the customer. It's not enough for us to provide the best equipment available. We are also committed to providing the best service and information. When a customer visits Red's Fly Shop, we make sure they have every piece of information they need and feel comfortable about getting it. The employees at Red's are honest, hard working individuals who are passionate about the business. We know this canyon is a very special place and that we are fortunate to be here. We invite you to come share this unique experience with us. 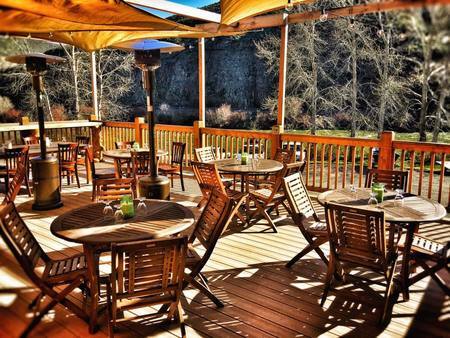 Canyon River Grill has the best riverside dining in the country. Here is a shot from the deck with the Yakima River in the background.